A few days ago my mom and I were discussing those silly people that post comments on recipe boards, such as All Recipes. Really? You substituted cinnamon with paprika and you’re shocked that it tasted funny?! You don’t believe that these comments exist? Oh, they do. Late last week I was inspired to whip up some sort of beer braised pork tacos. Maybe with some jalapenos and pineapple juice. Sounds ambitious, right? But I was really thinking I would just let all of the stuff simmer in the crock-pot all day. But I got busy. And forgot. And here we are in this week. 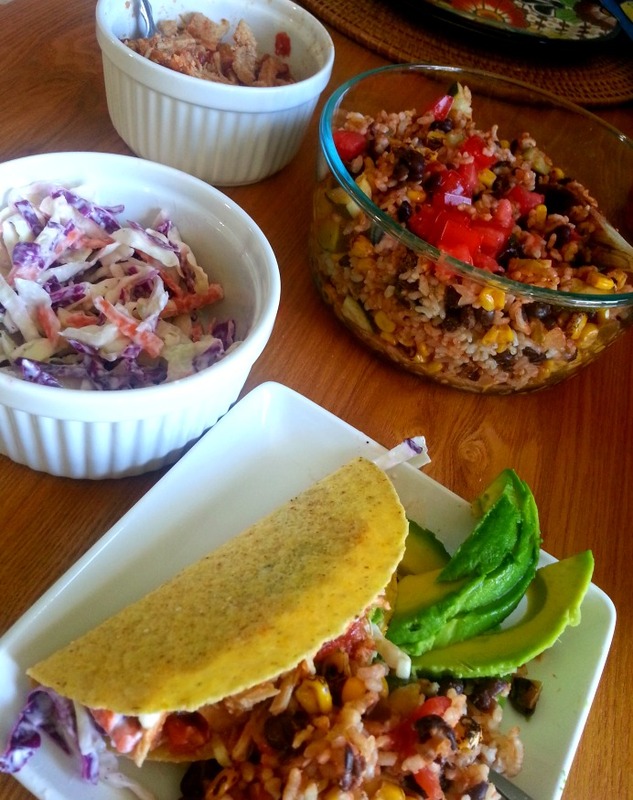 So this week I tried my hardest to create a bomb diggity recipe for these pork tacos so I could share it with ya’ll. I started out so well, making note of every ingredient as I added it. Then I just kept adding things. I tasted the pork once it was cooked, realized it need more something, so I added that. And while it turned out pretty well, it’s certainly no recipe so you’ll just have to settle for a photo. I also made that spicy slaw to the left. The peppers came from my garden. But yeah, still no recipe. I have no freaking clue how much of anything I put in that bowl, but it turned out pretty great. I know what you’re thinking… all of these words for one lousy photo? Sorry ’bout that. I told you, I tried. bahahahaha this is how so many of my attempted recipe posts turn out! you’ve put words to my life. LOL – I think I need to start reading the comment section on recipes more often! Jimmy Fallon could do a whole segment on that!! 🙂 Too funny! Thanks for making me smile! For some reason you went to my spam folder, hopefully I fixed that problem. Seriously… the comments are ridic. I honestly don’t know how some of these people don’t burn down their homes with their “great ideas”!